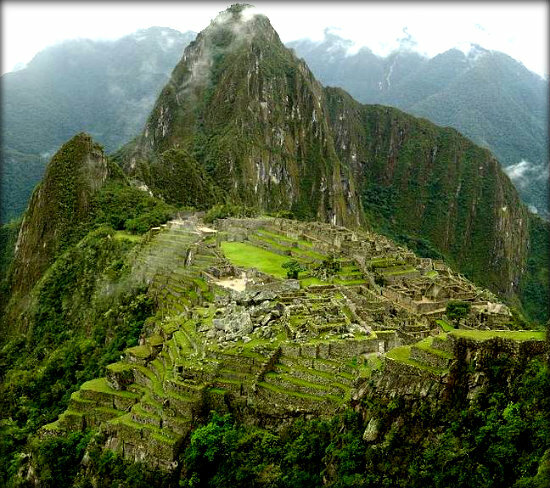 Here are some interesting facts about Machu Picchu. Machu Picchu is a city built by the Incas in about 1450. It is situated on a flat ridge, about 2,400 metres above sea level, and about 80 km from the Peruvian city of Cuzco. Although previously known to local people, it was rediscovered by an American explorer, Hiram Bingham in 1912. Its discovery led to it becoming one of the most famous and mysterious places in the world. It may have been built as a temple, or as a home for an important Inca leader called Pachacuti, who ruled in the 15th century..
Machu Picchu was abandoned when the Spanish conquest of Peru took place in the 16th century. The site consists of about 140 different buildings. Some of the most important structures include the Temple of the Sun, and the Inti Watana stone, which may have been an astronomical calendar. Machu Picchu was laid out to line up with nearby sacred mountains. The sun rises or sets directly behind some peaks, on specific days in the Inca calendar. Machu Picchu attracts about 400,000 visitors every year. In 1983 it became a UNESCO world heritage site and has since been declared one of the new seven wonders of the world. The Incas had no wheels or metal tools. Despite this, they built precisely, creating interlocking dry-stone walls from huge blocks, and they used hundreds of flat terraces to distribute water. A 3 day trek along the Inca Trail is the most popular way to reach Machu Picchu. Walkers must hire a guide and numbers are limited, due to fears of erosion. Many guides on the trail sleep with a mirror to protect themselves from evil spirits. They claim that the sacred ground often tries to pull them in. Visitors to Machu Picchu are not allowed on the site dressed in the traditional costume of another country, and several tourists have even been arrested for visiting the site naked. The site of Machu Picchu is over 2,400 metres above sea level. Some people think that aliens are responsible for constructing the buildings of Machu Picchu. It is sometimes called Machu Pikchu.